Got my new tower stand up today. you better leave for the stand a lot earlier than you have been. The angle compensation for a bow shot is mind boggling. Mile High Club in that blind! Gonna be fun when it’s icy. You would need a long-range rig for something at the base of the stand. Dont drink coffee before the am hunt without "dropping off your donation to the Obama administration"
Fire towers are cool but not sure I have the juevos to climb one. Tower of Babel. Cause you'll be babeling from lack of oxygen after climbing it. That would be a great lookout stand over a property. Are you seriously gonna hunt from this? Nose bleed territory and oxygen masks are a necessity! Doesn't really seem like it would increase your chances of seeing more deer. But it is freaking awesome. Last edited by sideways; 12-23-2017 at 09:34 PM. Trump got that wall built and It didn’t make the news? What shift you working on wall watch? 6.5 creedmore should work! We had (8) 50’ tall tower blinds on our lease in S Texas. You can see for miles out of them. Shot several deer over 300 yards out of them. It’s like shooting 100 yards out of a 10’ stand. We are all getting older and don’t feel like climbing that high anymore. Nice, reminds me of the lookout tower they use to have at Hagerman but it wasn't that dang tall though. You can just drop an arrow straight on them if you put a feeder underneath it. You hunt Africa from that stand in Brazoria County? I'm joking as most of you probably know.. I think this is a forestry service lookout tower BUT I'm game for "WALL WATCH". I work the DuPont schedule so I'm game for a few days here and there.. Oh I don't own a Creedmore. 7mag Sendero will have to do..
Don't laugh there's some ranch in S TX that has one that tall on it. They bought on old fire look out tower from the forestry service. I'm still working on my shooting skills.. Still working on doping that earth curvature.. I would love to set in that dude with a spotting scope and a bottle of Rebecca Creek. From what I heard it's for scouting from. You drink to much you might take the express down. Nah I would set it out.. Let it wear off..
What gets me is there are no guy-wires on that thing. 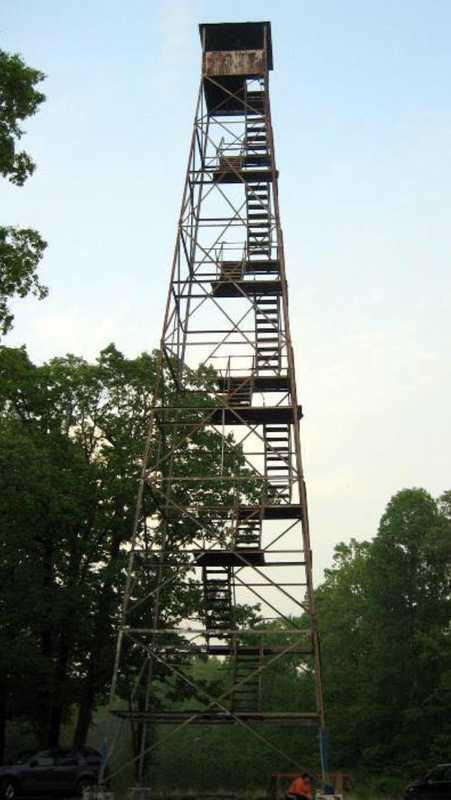 Y’all laugh, but one of the main properties I hunt in east TX has an old Forest Service lookout tower on it. It’s every bit that high and stands only about 300 yards from one of my feeders. Of course we’ve never climbed up it due to its now just a buzzard roost and cell booster......but we often joke about it. Looks like the person setting below it might be a tad out of shape double over about to puke after climbing down from that thing lol ! I'm out, I don't work that hard for a deer hunt. I have a buddy that has one that they put back together. It’s about that size but has a bigger top. Haven’t been up on it in years, not particularly stable platforms in their old age haha! I climbed the one you are talking about years ago. I think it was on hwy. 71 up around Fayetteville. Used to climb the old oil dericks when I was still in school. at least you could do is install a slide to get down! I'd put my bow blind on the third tier-platform.